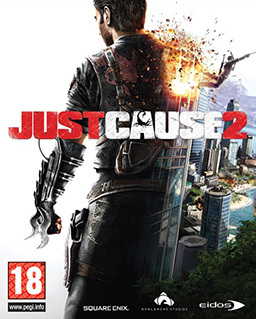 Developed by Avalanche Studios, Just Cause 2 finds Rico Rodriguez returning in an epic open-world adventure set in the diverse tropical playground of Panau in South East Asia, where the aim is to cause chaos and destruction in a way that only Rico knows how! His mission is to destabilize the island and free it from the tyranny of the evil dictator, Baby Panay. Players tackle missions and objectives in any way they want while exploring the highly-detailed and beautiful island by land, sea or air, performing an insane range of new daredevil stunts and mastering the use of the all new grappling hook and Rico's trademark parachute.